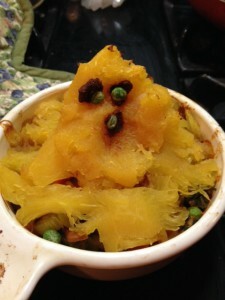 Maybe my little ghost made of leftover spaghetti squash looks more like a version of Big Bird than Casper, but this idea was just so darn cute I had to use up my leftovers to create a little Halloween comfort food. I had absolutely nothing to do with dreaming it up; I found it on this post at McDougall Friends–hopefully you can see the adorable photo to get the full picture. Thank you to the lovely McDougall Friend who inspired me to get spooky with my dinner. I had no potatoes on hand, but just enough cooked sphagetti squash to top an individual helping of a shepherd’s pie mixture I made from what was in my refrigerator. I hesitate to call it a recipe, but I will list what went into it and how I put it together so you can get creative and make your own haunted version of this easy classic. I also threw together a quick focaccia based on an easy pizza crust video from All Recipes. I actually didn’t use any of the ingredients they listed except the active dry yeast but I had a hunch the spelt flour would take kindly to the no-rise strategy, and I was right. I’ve also made this as an actual pizza. If you need a gluten free option, Bob Red Mill’s Gluten Free Pizza Crust Mix should work, perhaps with an extra flax egg, and allowing the longer rising time they recommend. My daughter-in-law has made it many times, substituting flax egg for the eggs, and just leaving out the olive oil or subbing it with water. 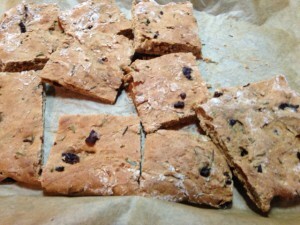 So don’t feel left out of the focaccia party, my gluten-free readers! Slice the mushrooms and dry saute in a pan until they are browned. Add a little water to pan and then add all the veggies, chopped and seasonings of choice. (I used garlic granules, poultry seasoning, tumeric, black pepper, a dab of Dijon Mustard, and a dab of my Korean style red pepper paste.) Add a tiny bit more water, cover and steam over medium heat for a few minutes. Lift the lid, stir and add in the kidney beans. Bake for 20-25 minutes until the squash is warm and the vegetables are bubbling. Serve with Very Quick Spelt Focacciam if you like. And multiply quantities if you want to feed a crowd. Okay, I’m not going to lie. This is not the focaccia my relatives from Bari taught us to make when they came to visit our family decades ago. Nor does it have the complexity of flavor of the sourdough pizza crust I made back when I had homemade starter to spare. But it takes less than an hour to make and it’s tasty in its own right. And I’m damn proud of the fact that I made it work several times with just what I happened to have, without bread flour, with spelt instead of wheat, with molasses instead of sugar, and with a tablespoon of flax egg instead of olive oil. I love rosemary with bread and I have a big rosemary bush right outside my new place, so I decided to add it to the dough, along with six olives chopped up, which, if you count fats as Dr. Swank would have, makes just 5 grams of unsaturated fat distributed among 6-8 pieces. I was worried it might not be enough, but it was plenty. Add the flour, flax mixture and salt and stir into a rough dough, Just as it’s starting adhere together, add the rosemary and the olives. Once it’s a dough ball, let it rest for five minutes. Turn out on a floured surface (brown rice flour is a nice non-stick medium) and start shaping it into either a round or a rectangle, depending on what kind of baking pan you have. The spelt dough is fragile, so transfer it to the pizza pan or baking sheet lined with parchment paper before you get it stretched out to the desired size, and then finish that process right on the baking sheet or pizza pan. Bake in the preheated over for 15-20 minutes. Let sit 5 minutes. Cut and eat! Notes: you can make this with any kind of wheat flour. And I’m pretty sure you can make it successfully with a Gluten Free Pizza Crust Mix, using flax egg instead of olive oil and/or eggs. Let me know how it goes! Have a happy and safe Halloween night. I love shepherd’s pie, both traditional and not-so-traditional versions! So, I love this recipe, and your adorable decorating skills make it all the more festive. The post is a good reminder that *fun* is an important part of the cooking process — and I also love the single serving option, which means that this could be a quick and easy solo dinner for me. Many thanks! 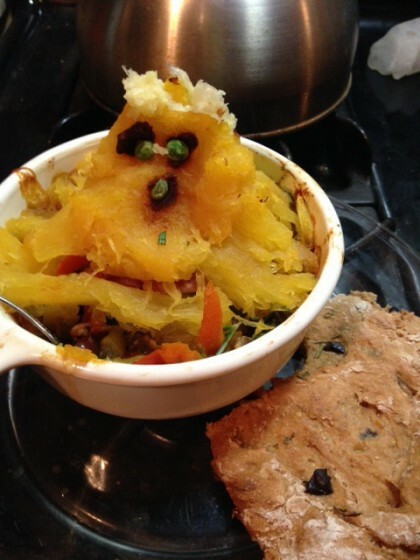 Cutest shepherd’s pie ever–love the ghostie! That said, I’m especially excited to try out the oil-free, gluten-free version of foccacia–the olives + rosemary combination sounds divine. The perfect partner for vegetable soup, yum! Thanks Lee! I’m glad you are excited about the oil free gluten free option for the flat bread. I just had another killer gluten free pizza crust made that way by my daughter-in-law this Halloween–it’s so nice to have that option! !